The new suction hose: Smooth elastic, tapered – with smooth outer skin for significantly improved handling, a longer service life, and increased suction power. It can be extended to meet your individual requirements by connecting two suction hoses. The new Cleantec extraction sleeve ensures a secure fit on the tool. The tool and vac ends of two suction hoses can be connected by inserting one into the other, therefore combining the two hoses into a longer hose. Festool's Antistatic hose design helps you work cleaner by preventing dust from accumulating on the exterior of the hose. It helps you work more safely by preventing static discharge or shocks. And you'll work more efficiently with a system that prevents clogging due to particulate buildup inside the hose. A durable, pliable design withstands heavy use and prevents kinking, for longer service life and more efficient work. 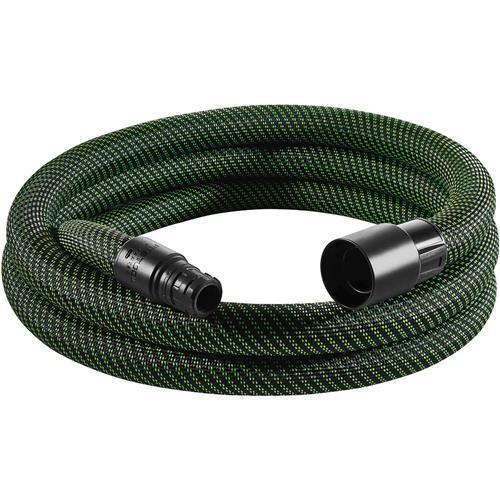 27mm x 5m (1 1/16 inch x 11.5 ft) Antistatic hose with rotating connector and reducing sleeve.